Thompson & Morgan prides itself on offering plants that give the very best garden performance, and our panel of more than 20 customer triallists help us do just that. Spread up and down the UK, our triallists grow a selection of Thompson & Morgan plants and report back to us on what they’ve managed to achieve. Our new product development manager, Michael Perry and photographer, Helen Freeman, took a trip out to some of our triallists this summer to see how they'd got on. Customers who join the scheme will receive a 50% discount on plants and seeds. 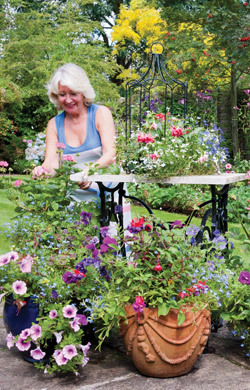 Triallists are asked to grow the plants to the best of their ability in their own gardens and/or containers, and then report on their performance. Please send a picture of your garden/patio together with a short paragraph explaining why you would like to become a member of the Thompson & Morgan Trial Panel, PLEASE, NO MORE THAN 150 WORDS. The judges will select new panelists according to who has, in their opinion, most clearly demonstrated that they have the skills, interest and enthusiasm for growing and nurturing plants. We select new members of the trial panel every January. Please email customertrials@thompson-morgan.com and entitle your email subject as 'Trial Panel Competition'. Terms and Conditions: By signing up to the Thompson & Morgan Customer Trial Panel, triallists agree to provide regular feedback and images throughout the growing season. Thompson & Morgan reserve the right to use all information in sales literature - either as web-based or paper catalogues. You also agree to adhere to strict confidentiality rules with regards to all products and communications with Thompson & Morgan.